The Domestic Animal Services in Naples and Immokalee are lowering their adoption rates. The shelters are overpopulated with cats, dogs, and rabbits. Staff and volunteers are hoping the lowered rates will encourage the community to take in a sheltered pet. NAPLES, Fla. -- The Domestic Animal Services in Naples and Immokolee are lowering their adoption fees until the end of 2018. The Director of D.A.S., Darcy Andrade says "The shelter is just overpopulated. We're really hoping that this [lower rates] drives people in here and gives people an incentive to come and consider a sheltered pet." 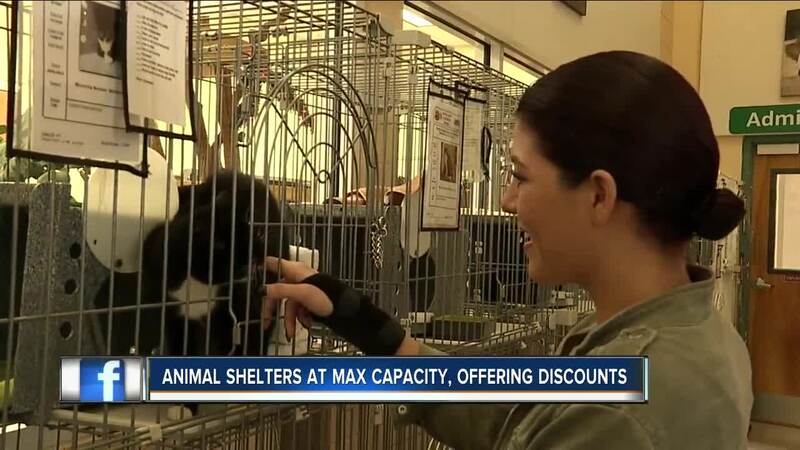 The director says the shelter's prices are hard to match: twenty dollars to adopt a dog, ten dollars to adopt a cat, and five to adopt a rabbit. "Some animals have lived here for over a year," Andrade tells Fox 4. "We just want them to find a home." Jazmine Yamamoto says she's been looking to adopt a dog for a while but she's "only looking to get a dog from a shelter." She tells us this route saves money and lives. Volunteer workers say the shelter's capacity is over the limit by more than 100 animals. According to the director, 30 dogs and 70 cats are currently up for adoption. Naples resident, Rick Treder, adopted two kittens for ten dollars this afternoon. The D.A.S. had a two-for-one sale today which allowed Treder to score the deal. "I got lucky. I'm going home now to surprise her [his wife]. I might get in a little bit of trouble but it's all worth it." Treder says he and his wife had to put down their sixteen-year-old cat back in January and they knew if they got another cat, it'd be from a shelter. "I think we're ready. The joy of a new kitten is so amazing." The Domestic Animal Service's adoption days are Monday through Saturday 10am to 6pm. The Immokolee shelter's adoption days are from Tuesday's through Saturdays, 12:30pm through 3:30pm.